You will earn 2,898 Reward Points. Earn 1 reward point for every 1 dollar spent. 1/2 HP Capacitor Start Motor. #12 Power Take-Off (PTO) hub. Hardened alloy gears in transmission. Change speeds without having to stop the mixer. Two-piece, stainless steel, dishwasher safe safety guard. Variable Speed Drive: 4 Fixed Speeds or any Speed in-between. Durable NSF approved hybrid epoxy/polyester powder coat finish. Interlock switches protect operator from injury if safety guard is open or bowl is lowered. 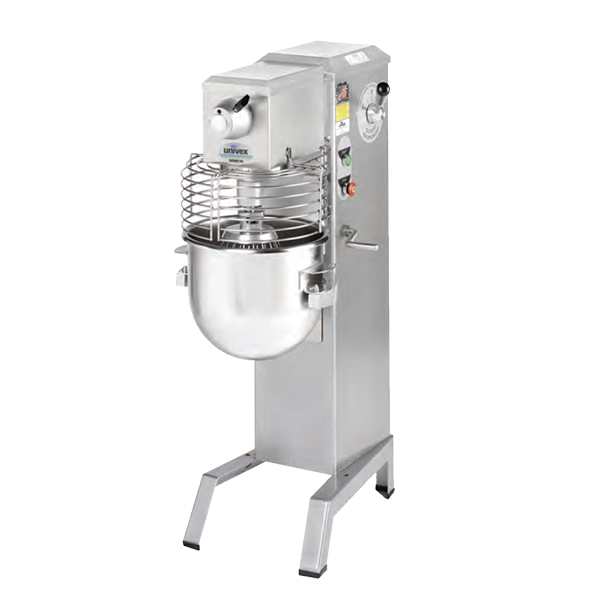 The SRMF20 mixer carries a two-year, on-site parts and labor warranty against any flaws in materials and workmanship. This period begins on the date of the purchase and, provided the unit is used in accordance with our instructions, is in full effect for two years from that date. Any work performed under this warranty must be performed between the hours of 8am and 5pm Monday through Friday. Univex will not pay for overtime charges for work performed other then during normal business hours. Damage incurred in transit or from installation error, accident, alteration or misuse is not covered. Univex shall not be liable for any consequential compensatory, incidental, or special damages. Contact the Univex service department for any warranty claims.